Wow. This stage is so fun! This month he has been busy walking around holding onto furniture and eating anything that is put in front of him. He also has started high fives, kissing (if there are no toys to distract him) and lots of clapping. His favourite addition to clapping is having a toy in each hand, spreading his arms apart as far as they will go and smashing the two toys together, hopefully creating a loud smashing sound. He is still 22lbs and has def. slowed down in the growth department (only 1 1/2 pounds in 4 months!). Another big thing for the month is the emergence of teeth! There are 2 through (one on the top, one on the bottom) and two more are currently pushing through. I'd have to say that this is the only difficult thing about this stage. I have to say that the older he gets, the more I love him and my heart actually hurts a little when I look at him. Hurts in a good way, but a way in which his existence is so important in my life that it makes me a little nervous. 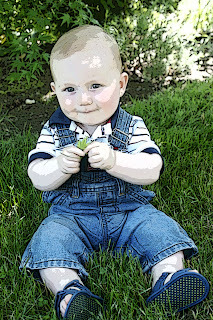 Nervous about how I will feel when he grows up and leaves (I know, enjoy the present, why am I being so crazy? ), nervous about the future hurts and whatever else could happen out of our control. This whole parenthood thing is scary emotionally as you open yourself up to whatever may come your way. I do mean to make this sound positive in the fact that I just love him so much and I have a feeling that it will continue to grow. On that note, Gary's love does not change. Isn't this weird? He says he loves me the same as when we got married. He loves Kai the same when he was born as now. Maybe I'm the strange one but boy, my love grows in magnitude and depth all the time! I just find it fascinating (and perhaps a bit sad?) that his love doesn't grow. Is it already maxed out? Weird. I feel like there are so many different levels to love and he just feels one. I don't know, we are def. different! Kai goes through many nicknames but amongst my sisters he is known as Kaiser bun or Kaisie and for me, he has currently been bubba or bubbs. He loves other babies/kids and wants to touch everyone's noses and mouths (and he REALLY loves pulling Gary's hair). His favourite toys are blocks to stack and smash together, puppets (which he will kiss), and anything that squeaks. The biggest grins and squeals are still elicited when he sees or gets to touch a dog. Happy 10 months Bubba! I love you and I'm so excited for you to walk all by yourself because I know you want that so badly! Thank you for being such a good boy, even when you are in pain from all those teeth. Thank you for giving daddy high fives and mommy slobbery kisses. Thank you for going for walks with me all the time. Thank you for being good with other people. Thank you for eating like such a good boy, all by yourself. Thank you for letting me hug you and kiss you all the time. I'm so much looking forward to seeing you grow and hopefully one day, you will be able to be a big brother because I think you have so much love to give.